In the previous posts, I have shared to you an alternative algorithm for multiplication and division. In this post, I am going to share with you a different algorithm for performing subtraction. This algorithm does not involve “borrowing” from a higher place value but subtracts individual digits. To illustrate this algorithm, let’s consider some examples. First, we separate the digits of the numbers as shown below. For iPhone users, the long wait is over. 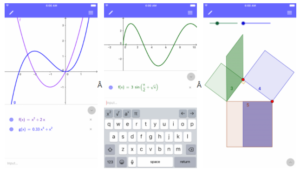 In case you missed it (I missed it actually), GeoGebra has released the GeoGebra Graphing Calculator for iPhones last December. I have only personally used the app for a week and I’m really satisfied with its performance and speed on my old iPhone 5. For those who have not tried GeoGebra, it is a free and open-source software for teaching mathematics. We have a lot of tutorials about it here which I’m going to update to the current version of GeoGebra this year. GeoGebra is available for desktop computers, tablets, and Android phones. It comes on multiple platforms including Windows, Mac, and Linux. You can also install it in the Google Chrome app.